The part of the journey when you have left where you were, but have not arrived at the new place. You are faithfully moving forward, but the trip has become long enough that you are really, really ready to arrive. You have been traveling long enough that your mind is past the excitement of the new adventure and now you are just plain missing your past. The in-between. I love how the Lord uses word pictures and metaphors to speak to me. This week is VBS at my church and I am taking a much smaller role than usual. I know that I am being obedient in stepping back, but last night when I was folding laundry and cleaning out my car during VBS, it just felt stupid. Why would I ever choose to fold laundry over ministering to my favorite kids in the world? The truth is… I wouldn’t. But the Lord has been requiring me to let go, and to be honest it is downright painful. This week, the theme is “I’m Grounded.” I feel grounded, but not in a good way. I feel like the Lord has required me to spend more time in my room and less time playing with my friends. I am missing so many of the activities and people that I loved being with, but I know that my father has told me to take a break for a while. I never choose to take a break on my own. I suppose I am just not disciplined enough to choose that. As I was talking to the kids on Monday night about how the seed goes into the soil, the first thing that happens is that is starts to establish roots. I reached into my bag of miracle grow and there was a bulb that I had left in there from about 6 weeks ago when I had shared a similar message at MOPS. I had no idea it was in there and right in front of the kids I pulled out the bulb. The roots were soooo long and the green stem of the plant was just barely emerging. The bulb was getting grounded so that it could be strong enough to stand firm. The roots were growing deep into the soil, but on the outside, the plant was just beginning to emerge. The lesson was for me. The Lord is growing my roots and in order to do that I have to remain still for a little while. He has pruned away all of the other buds and growth so that all of His energy can be put into thrusting my roots even deeper. If I am going to stand strong in the new place, I need deep deep roots to be established and those do not grow over night. I want the Lord to bear much fruit in me, but in order for that to happen, He has had to prune off the smaller fruit so that my roots can grow deeper and my limbs stronger so that I can hold up during the next harvest. Oh, the in between. A necessary place….. Lord, help me to embrace the in-between. 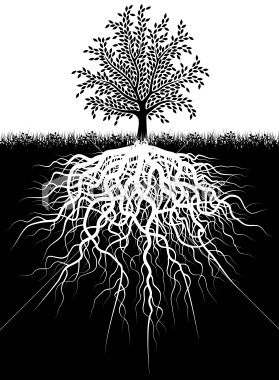 Help my roots to grow deep so that I can be grounded, rooted and established in the Love of Christ! What about you? How is the Lord working in your life right now? Are you growing deeper roots, being pruned or are you at the peak of harvest for this season? Wherever you are on the journey, I pray that you sense the Lord’s love and care. He thinks you are pretty special! 16 I pray that out of his glorious riches he may strengthen you with power through his Spirit in your inner being, 17 so that Christ may dwell in your hearts through faith. And I pray that you, being rooted and established in love, 18 may have power, together with all the Lord’s holy people, to grasp how wide and long and high and deep is the love of Christ, 19 and to know this love that surpasses knowledge—that you may be filled to the measure of all the fullness of God.20 Now to him who is able to do immeasurably more than all we ask or imagine, according to his power that is at work within us, 21 to him be glory in the church and in Christ Jesus throughout all generations, for ever and ever! Amen. 40 Days Join Cindy for a 40 Day Journey that will change your life! Lance and I completely disagree! And they stole from the Operation Christmas Child Boxes!